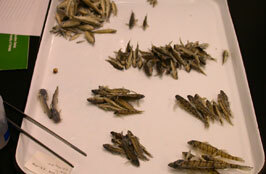 The Ichthyology collection at the Biodiversity Institute includes more than 680,000 specimens of fishes. While the collection features many types of fishes from across the world such as Ecuador, Fiji, and Nicaragua, the ichthyology collection concentrates on freshwater fish from the Midwest. One of the most important freshwater species is the Topeka Shiner (Notropis topeka), a threatened species of minnow in Kansas that is found along the Mississippi drainage and thought to have lost 70% of its occurrence in the last 40-50 years. It once inhabited all major drainages in Kansas but is now restricted to the Flint Hills headwater streams in the Cottonwood and Kansas River drainages. Another important and interesting specimen in the collection is the coelacanth (Latimeria chalumnae), which is a prehistoric species known from the fossil record from 65 million years old. The species (the only living species in the Order) was first discovered off the coast of South Africa in December 1938 – caught by a trawler fisherman and noticed by the curator of the East London Museum, Margorie Courtney-Latimer for whom the genus is named (Latimeria). 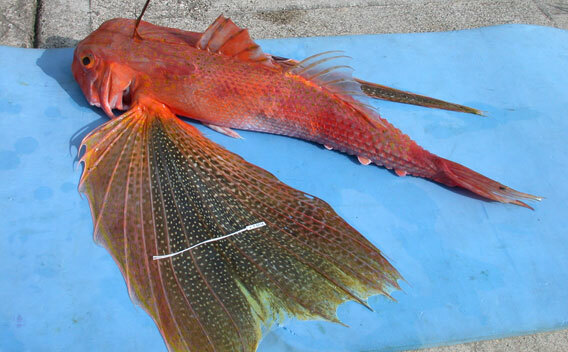 The KU specimen (catalog number KUI 22082) was collected off the main island of the Comores, Grande Comore, in 1986. 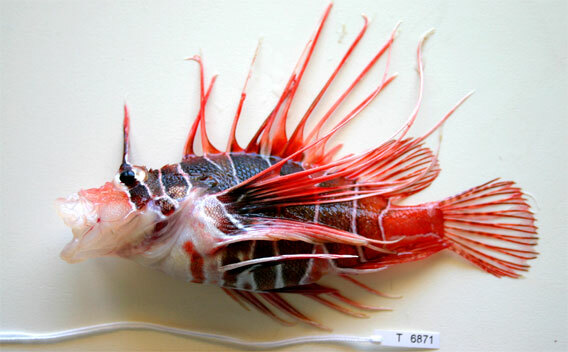 The specimen was caught by a fisherman, donated to the American Explorer’s Club and subsequently gifted to the Virginia Institute of Marine Sciences (VIMS). They subsequently loaned the specimen to us for research. The specimen is relatively small at 972mm total length and weighing in at 13.5kg (they can reach three times this length and weight). There are only about 250 specimens in museums around the world and the species is now CITES I listed making it one of the most endangered species on the planet due to its small distribution and slow growth and reproduction rate. In addition to fish specimens, which are stored in 70 percent ethanol or as dry skeletons, the collection also includes 11,000 frozen tissue samples. Such samples are important for genetic research and can be important in identifying new species and elucidating family trees. The collection is easier to manage and keep track of because of the online database, Specify 6, created at KU through our Bioinformatics initiatives. 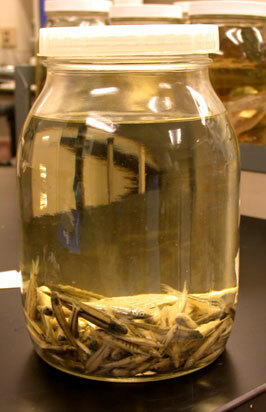 Photos, field notes, and other information are connected to specimen records in the database to aid research endeavors conducted using these specimens. The collection is among the top twenty in the United States and is used nationally and internationally through personal visits and loans sent around the world through the mail. It is a great resource and open for any researchers interested in the region’s fishes. KU is one of 12 partner institutions involved in the NSF funded (NSF0067017) Fishnet 2 georeferencing initiative. The aim of the project is to georeference all localities from over 50 providers worldwide in the Fishnet2 portal that do not have latitudes and longitudes assigned to them as yet and provide all metadata associated with these points (error radius, polygon, date of georeferencing etc.) using the GeoLocate Collaborative Georeferencing (COGE) system. We have a georeferencing technician (Katy Wichman) on site who is involved in georeferencing assigned parts of the globe for all partner collections. As of August 2013 over 700,000 specimen records had been georeferenced and the project was well on track to complete all localities in the system. The University of Kansas Ichthyology collection contains more than 680,000 specimens and approximately 11,000 tissues of fishes from around the world and is the basis of the research and educational activities of the Division of Ichthyology. The Biodiversity Institute Ichthyology division loans specimens and gifts tissue subsamples to qualified research organizations all over the world. Loans are normally made for a period of six months unless specific permission is otherwise obtained. After six months, the return of the material may be required before a re-loan is granted. An extension of the loan period may be granted by a Curator or the Collection Manager. To request a loan, see this policy. The fish collection has representation from 3,249 taxa (308 families and 1,310 genera) and 97 countries including Ecuador, Fiji, Mexico, Nepal, Nicaragua, and various marine localities. The frozen tissue collection continues to expand rapidly and has broad representation of both marine and freshwater fish diversity – 11,000 individual tissue samples from 2,556 taxa (314 families and 1156 genera) and 97 countries (Australia, Belize, Ethiopia, Fiji, Nepal, Seychelles, South Africa and Tonga etc., as well as oceanic localities). The collections and the scope of research activities in the division continue to grow due to the ongoing activities of ichthyology staff and students. Fishes in the collection have been collected for research from all over the world as evidenced from the map of collected localities from the voucher collection.